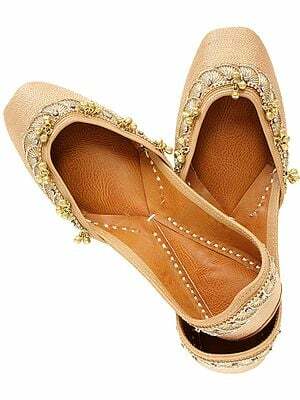 One of the most popular shoe types in India is the jutti, a shoe with a pointed toe, with or without a back part. 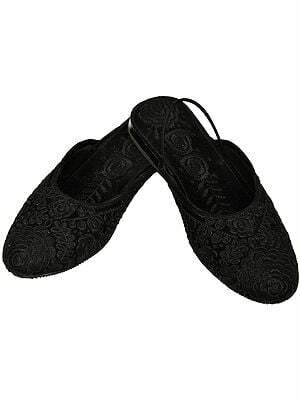 Juttis are usually made of leather, but the design also appears in a variety of other materials including textiles. 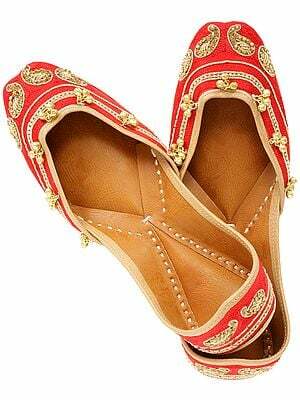 The jutti is worn by men, women and children across the length and breadth of India. 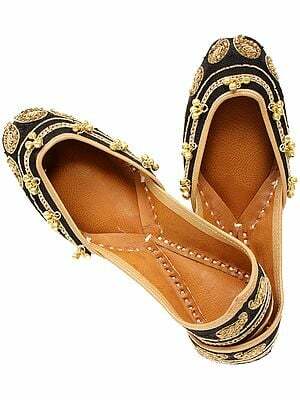 The jutti is closely related to the mojari, which was introduced during the Mughal conquest of India in the early i6th century. Since that time a wide range of mojari styles evolved across the Indian subcontinent. 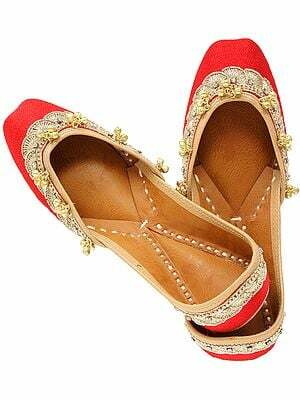 The traditional aristocracy wore velvet mojaris with extremely long, flattened upturned toes. These shoes were invariably embroidered with smooth gold zari embroidery, or zardosi and salma sitara, an elaborate embroidery style featuring gold wire, sequins, and frequently the application of beads, pearls, iridescent beetle wings and even precious stones. 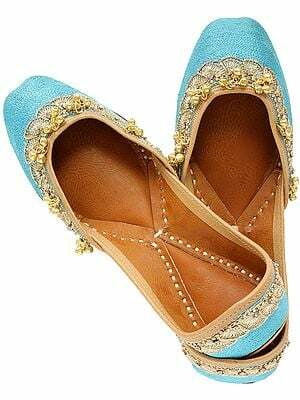 Less costly derivatives of this courtly shoe are now prized for weddings and ceremonial wear. 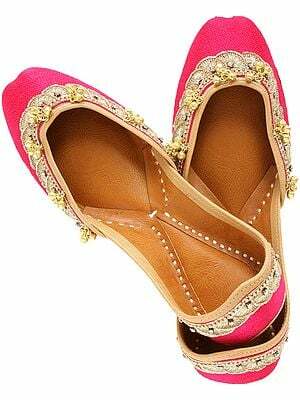 Today, jutti and mojari production continues to be concentrated in central and northern India, the regions which formed the stronghold of Mughal power. Contemporary workshops making juttis vary in size. In villages they are usually made by a mochi, a local shoemaker. Larger communities often sustain workshops employing several people among whom the work is subdivided. 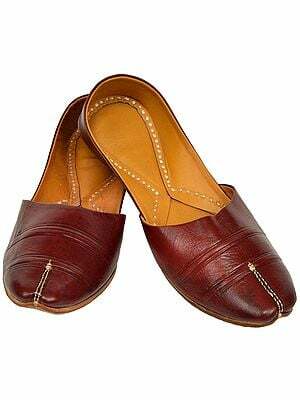 Over the last 50 years small and medium-sized factories have manufactured and sold juttis and mojaris. Some of the large industrialised plants produce machine-made juttis, which are usually cemented or made by direct injection of the sole to the upper. 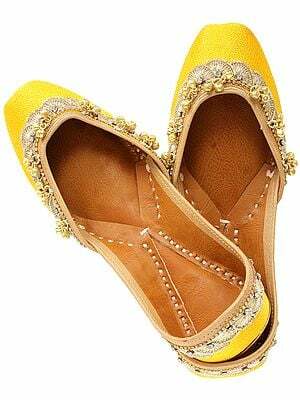 These shoes are sold through retailers and wholesalers across the Indian subcontinent. 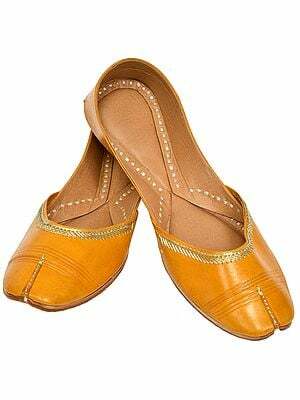 Jutti is an Urdu word for a shoe with a closed upper attached to a sole. Juttis come in many variations according to regional tradition, period and shoemaker, and are adapted according to the environment and materials. 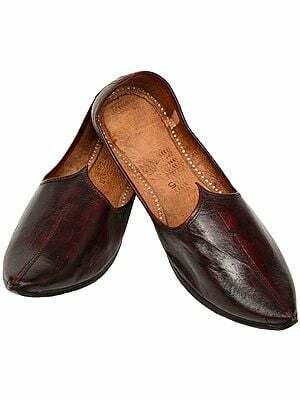 Juttis have no left-right distinction, are inevitably flat-soled, with round or pointed (sometimes extended) toes and closed counters, or with no counters at all, in the form of a mule. 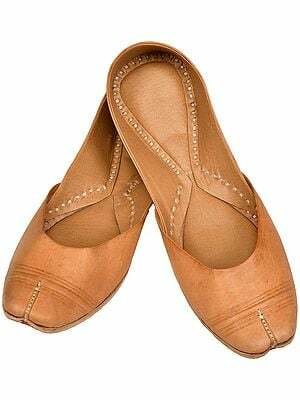 The upper is made of one piece which is joined in the back, and the throat- line can be round, straight or peaked, often with a central decorative strap extending across the top of the vamp from toe to instep. 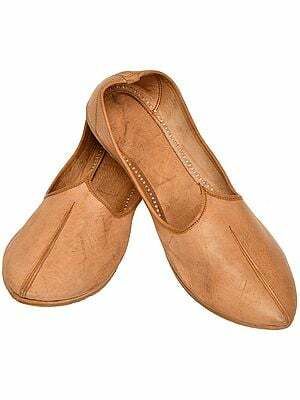 Juttis are made with buffalo, camel, or cow leather soles, and with leather or textile uppers. The sole is stitched with several strands of white cotton. Decoration varies according to region, and includes wool, silk nr metal thread embroidery, wool tufting and pompons. 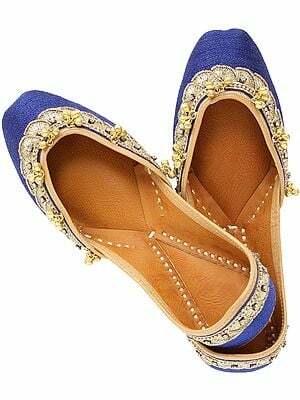 Juttis are worn in Gujarat, Punjab, Rajasthan, Haryana, Maharashtra, West Bengal and Uttar Pradesh. 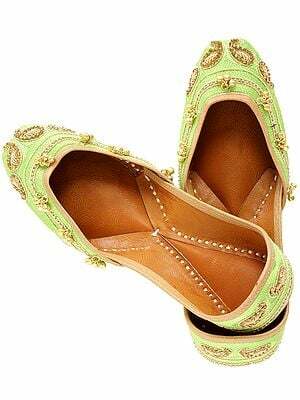 Salim Shahi juttis are a popular style named after Prince Salim during the reign of Emperor Jahangir. Rulers and courtiers, even in smaller courts, adopted the fashion. 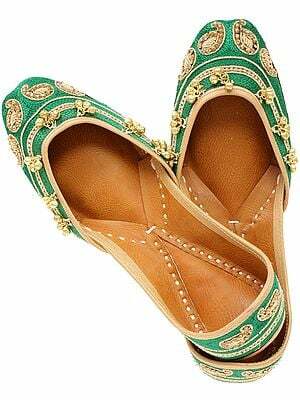 Despite its princely origin, it is a simple jutti for everyday wear, and is characterised by a pointed, sometimes curled toe and peaked throat-line. 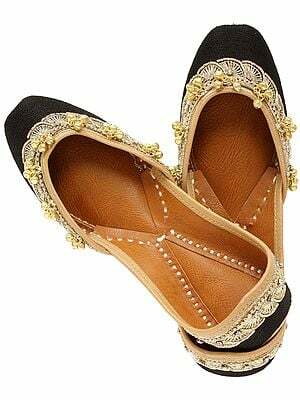 Nagra juttis are light, plain, often black, made of leather or other materials. 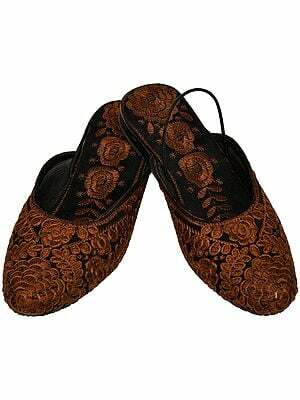 Originally made by Rajasthanis who came to Lucknow in the i9th century, they are mainly worn in cities. 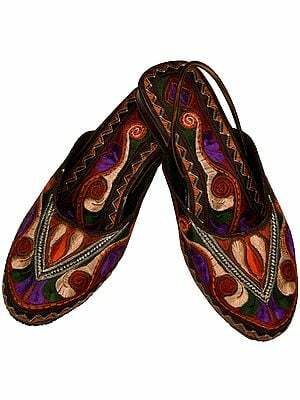 Desi juttis are decorated with cotton embroidery and are mainly worn by zamindars. 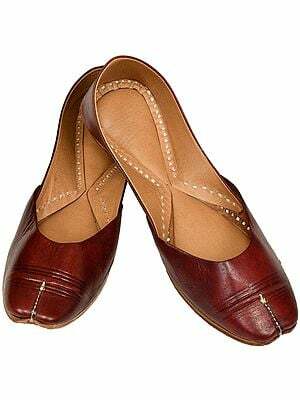 Dolkha juttis are a heavy style with a round or pointed toe. The word mojari (also mojri, Mojadi, marhatti and other spellings and names such as pagarkhiyas) generally refers to a man’s closed shoe similar to a jutti, but with a pronounced curled toe. 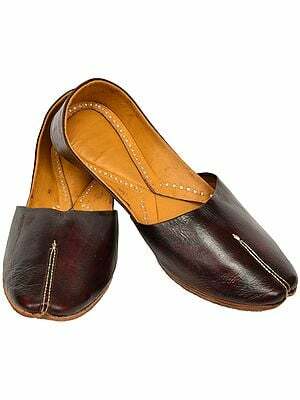 Mojaris are made with buffalo, camel, or cow leather soles, and with leather or textile uppers. 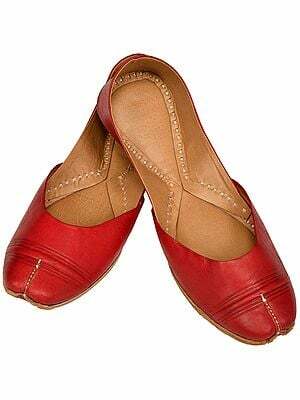 They appear in many variations according to regional tradition, period, and shoemaker; they have no left-right distinction, and are often flat-soled, or with a heel of varying heights. 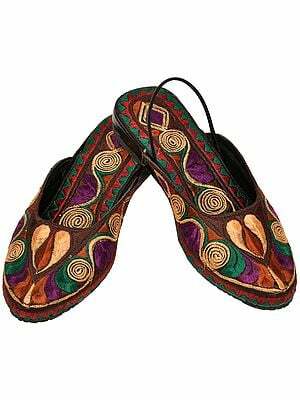 Uppers, usually embroidered with gold, silver or lurex, are of one piece, jointed at the back, folded in and stitched with heavy thread or leather thongs to the leather sole. The counter is often folded down, or has been removed altogether. The throat-line is frequently peaked, with a trefoil on the instep, or sometimes extending to another point, which is wrapped with thread. Toes are always extended, either in a flattened point, or the entire toe is flattened out several inches, and then curled under. 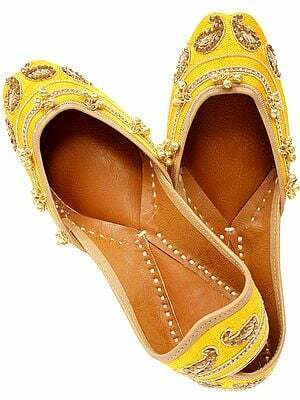 The upturned toe added up to one third of the total sole surface for embroidery and other embellishment. An extreme version of the curled toe appears in the ghatela, a shoe with a large toe-piece curling back over the foot, at times so large as to resemble an elephant’s trunk. Bells, beads, precious stones and pendants are frequently suspended from the toes, which jingle as the wearer moves. 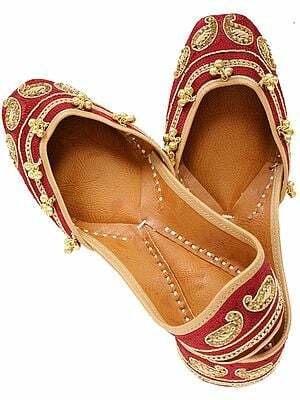 Traditional mojaris with heavily embroidered uppers are made by specialised craftsmen and are sold in special bazaar-type stores. Many of them are ordered for special occasions. 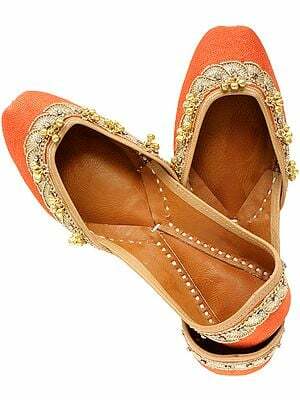 Mojaris are worn in Rajasthan Gujarat, Punjab, Bihar and Uttar Pradesh. A particular type of thickish shoes called mojdis are made in Rajasthan. 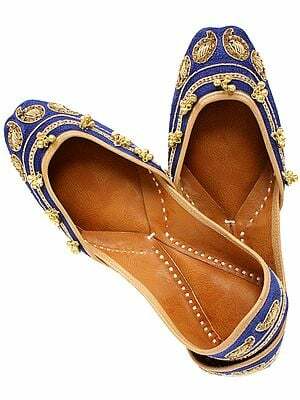 Sewn out of locally cured leather, they are usually ornamented with silk or metal embroidery or beads, or designs done in appliqué with thin leather pieces of different colours. They are very popular with the common people. 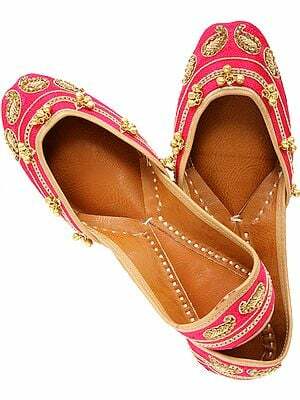 In Jaipur this has been refined to an art and the most fancy and sophisticated footwear is turned out. Soft and dainty, the pair can be rolled into a little ball. The designs are extremely delicate and the choice colours that are used make them coy pictures in subtlety. Jodhpur has good embroidery in v virile patterns, in bolder shades and in strange contrasts.